All our rooms have direct access to private bathrooms/toilets. Room “Tournesol” (Sunflower) and “Coquelicot” (Poppy) on the first floor, are jointly suitable for a family with one or two children. However, they are extremely adequately arranged to be rented separately, as well. The room “Iris” (Iris), which is situated on the ground floor, is a spacious room with an en-suite bathroom where you can use a bath, a separate shower, toilet and bidet. The room "Pivoine" (Peony), also situated on the ground floor, is a large room. For the sake of completeness: pets are not allowed. If you click on the name of one of the rooms you can look at some pictures of that room. 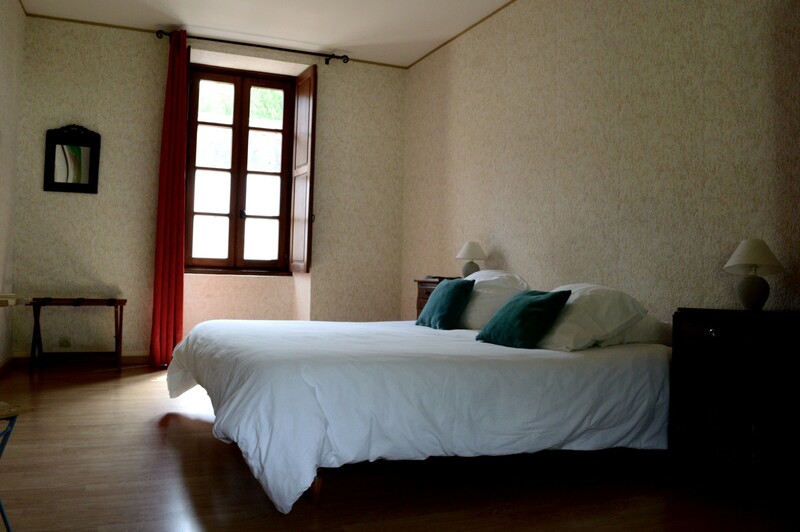 In our bed and breakfast you can make use, together with the other clients, of our Library and Living room. Here you will find a television with a satellite dish, a dvd- and cd-player and a refrigerator. Furthermore, you can serve yourself a coffee or a tea (the whole day through), in the coffee/tea corner which is at your disposal. And finally, there is a WiFi connection, which can connect you to the internet via your own laptop or mobile phone. For more details about our house and its direct surroundings you can click on the following links. 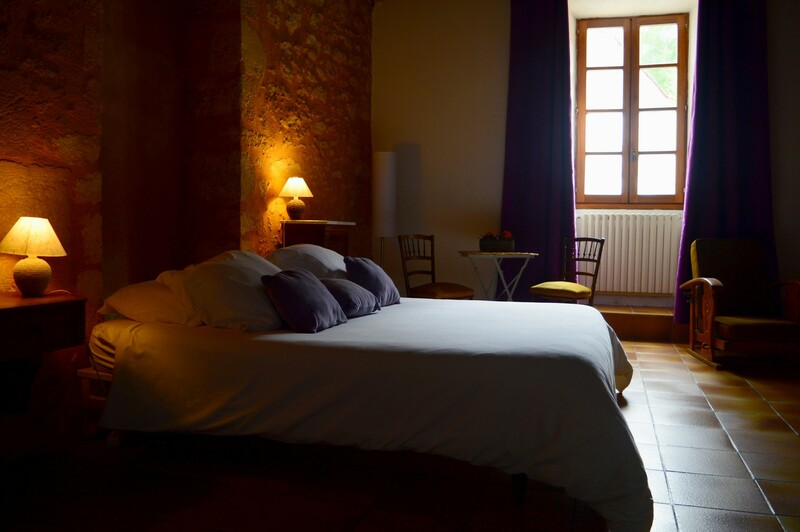 Room "Tournesol" is situated on the first floor and has access to a private bathroom with shower and toilet. The room can be reached via a covered gallery, which is being shared with room "Coquelicot". From this gallery you have a beautiful view over the valley and the woods. It is a cosy and comfortable room with a double bed (160 x 200). Room "Coquelicot" is situated on the first floor and has access to a private bathroom with shower and toilet. 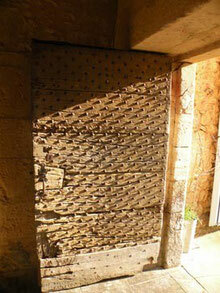 The room can be reached via a covered gallery, which is being shared with room "Tournesol". From this gallery you have a beautiful view over the valley and the woods. 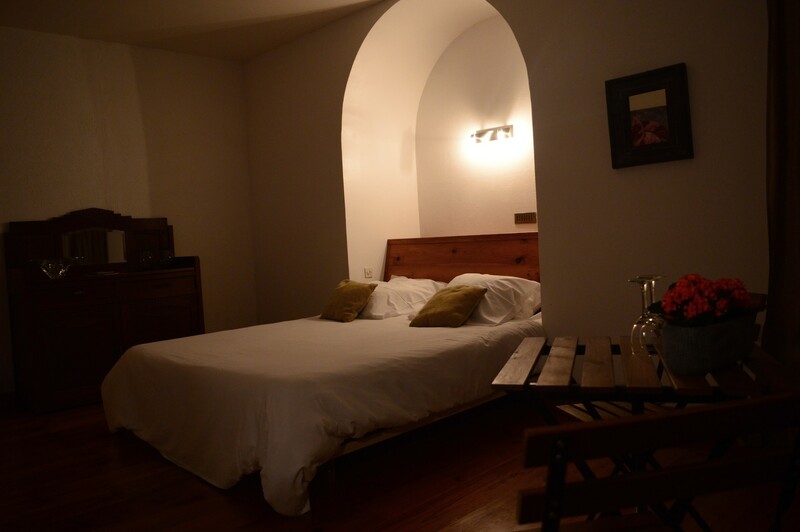 It is a comfortable, spacious and light room with a double bed (160 x 200). Room "Pivoine" is situated on the ground floor and has access to a spacious bathroom with a shower, a toilet and a washbasin. The room has a lovely parquet. fire place, one of the three which you can find in our premises. 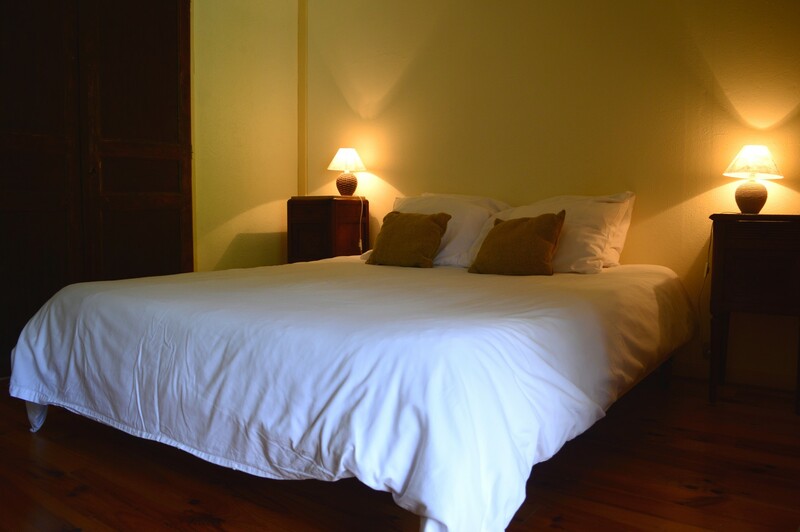 In this spacious, comfortable and light room is a double bed (160 x 200). Room "Iris" is situated on the ground floor and has access to an exquisite bathroom with a bath, shower, toilet and bidet. The room has a lovely wooden ceiling with big oak beams. Opposite the “en pierre” wall, there is a fire place, one of the three which you can find in our premises. In this romantic room is a double bed (160 x 200).